Today started off foggy, again. 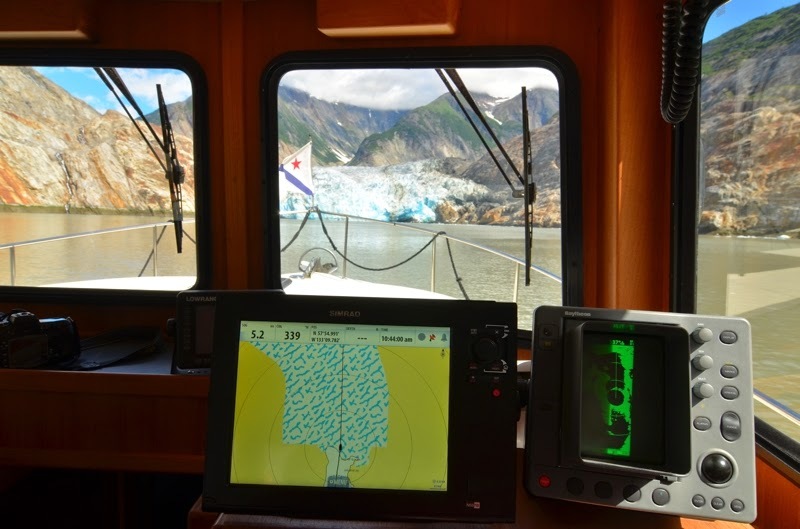 We pulled anchor around 7:30 and started into Tracy Arm with decent visibility, but it quickly closed down to a quarter mile. Enough to avoid the ice, but not enough to take in the stunning fjord landscape. 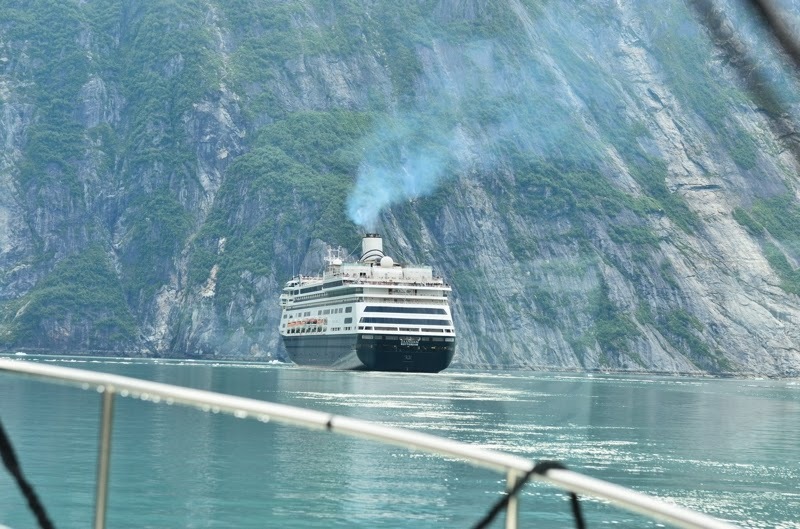 The cruise ship Zaandam was five miles ahead of us, and I called them on the VHF and asked how the weather was. They reported clear skies, which was encouraging. 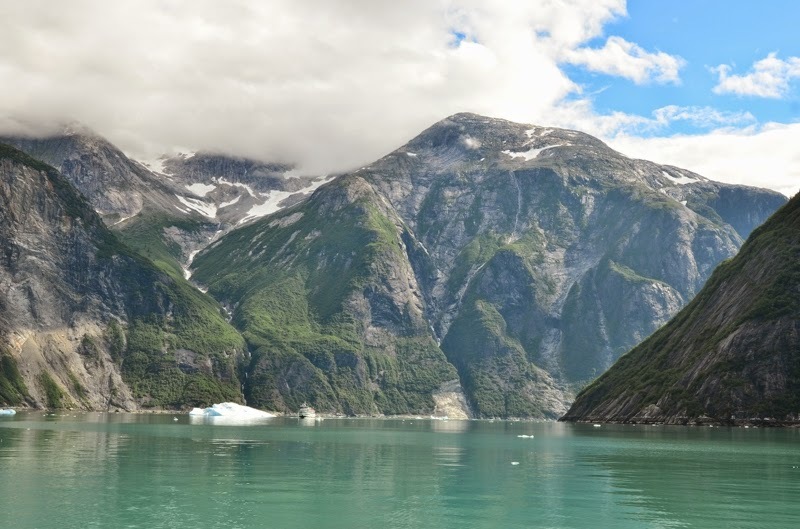 Sure enough, they were right…as we continued into Tracy Arm the fog lifted and gave way to brilliant sunny skies. Perfect! Not a bad view in any direction. Getting to North Sawyer Glacier was easy, with very little ice to dodge. 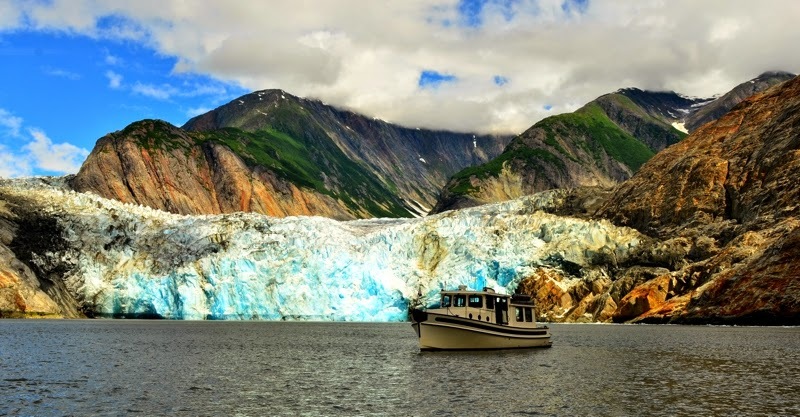 I got the boat within a quarter mile of the face of the glacier. 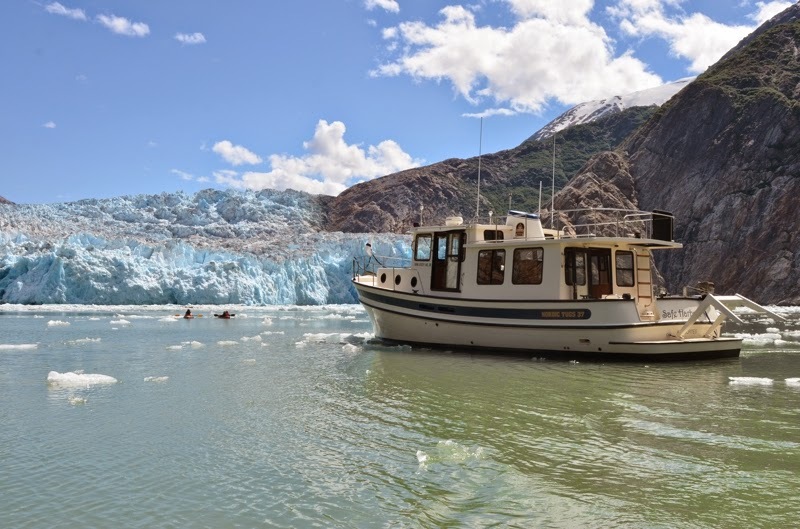 The rest of the group got in the dinghy and explored around for a bit, then we made our way to South Sawyer Glacier. Approaching North Sawyer Glacier. Not the lack of ice. Yep, the glacier is receding. Safe Harbour in front of North Sawyer Glacier. Getting to South Sawyer was a bit more difficult, but not bad. I maneuvered past Zaandam, which was holding station over a mile from the glacier, and picked my way through the ice. Through the binoculars I noticed people standing on several of the larger icebergs. Then I saw a tour boat dropping people off and picking them up. It turns out a tour operator picks people up from the cruise ship, deposits them on icebergs for photos, and then picks them up. I’d always been under the impression that walking around on icebergs is pretty dangerous, since they have a tendency to shift unpredictably. As we approached South Sawyer a massive chunk of ice calved off the face, creating a geyser of spray several hundred feet high…a good reminder of why it’s important to keep some distance between the boat and the glacier. 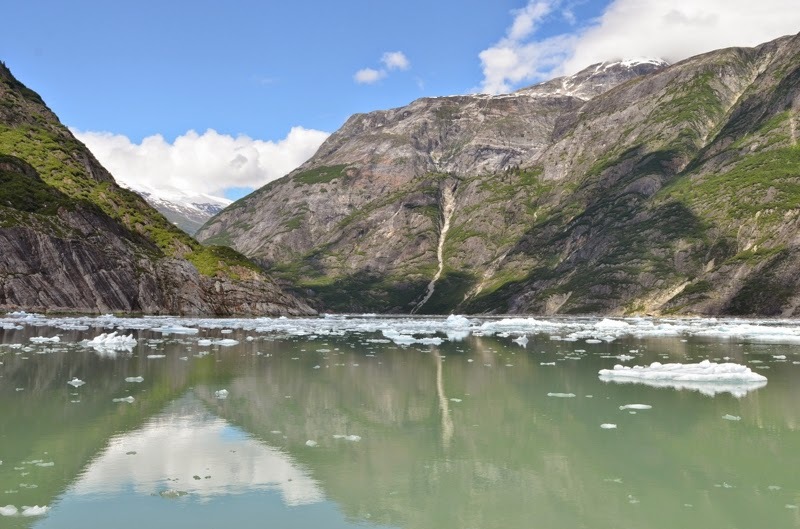 A half-mile from the face of the glacier the ice final closed in, preventing further progress. I shut off the engine and dropped the kayaks in the water. Under beautiful sunny skies we spent the next hour puttering around the ice, soaking in the views. 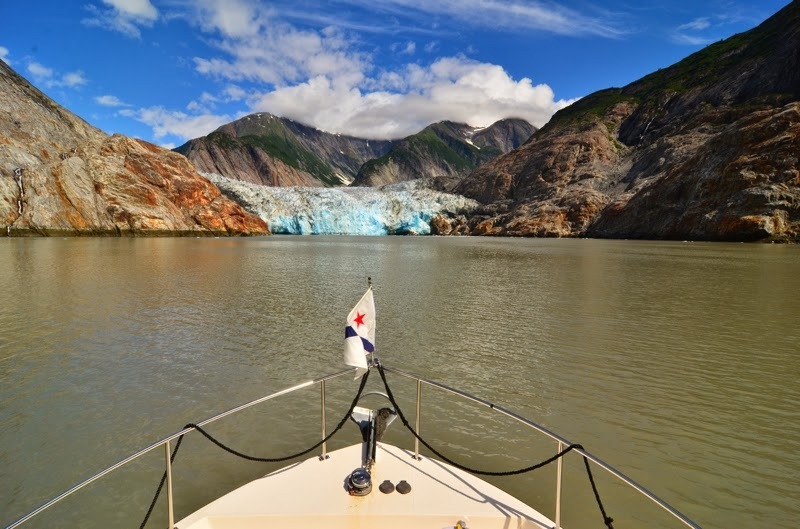 Tidewater glaciers are magical places, and all the more so on a sunny day. Safe Harbour at South Sawyer Glacier. It is much larger than North Sawyer. 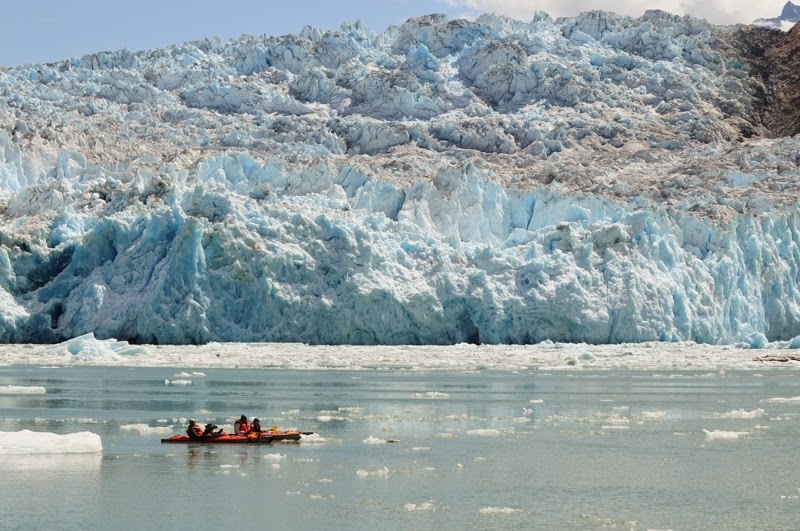 Kayaking at South Sawyer Glacier. 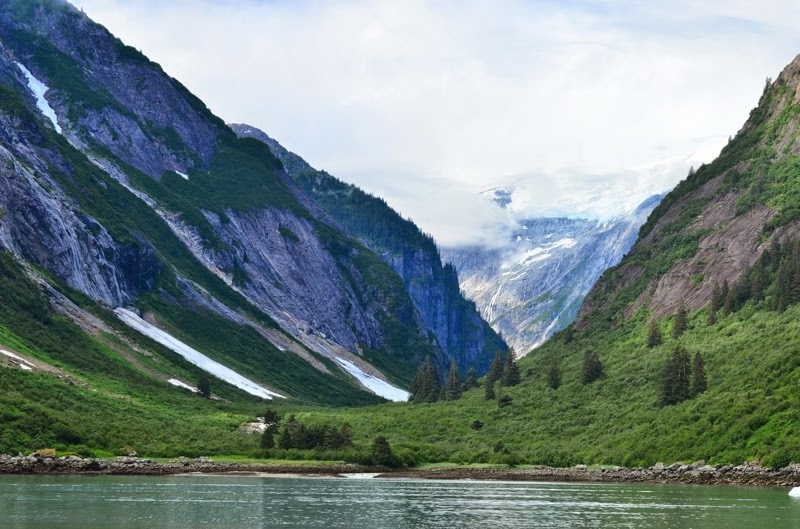 The trip out of Tracy Arm was easy. No fog, but a bit of wind. By 4:30 we were back in Tracy Arm Cove. Boating in the ice is exhilarating but also exhausting. I was ready for an early night after 8 hours of dodging icebergs today.